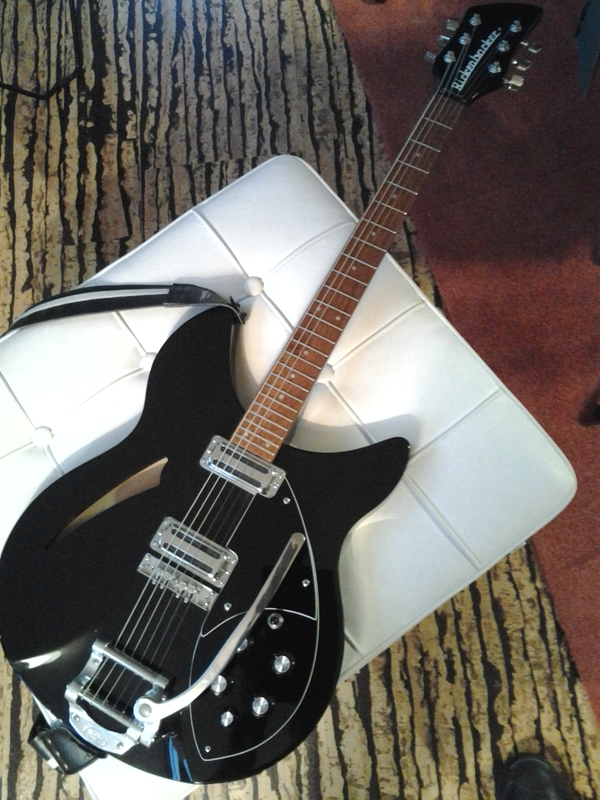 My first electric was a mapleglo ’85 Rickenbacker 360 I picked up for $500 brand new with hang tags and no case at a sketchy guitar store in a sketchy part of Metro-Detroit right after I got my driver’s license in ’85. Somehow, I never drew the obvious conclusion from that telling configuration of elements. It was a great guitar, and I loved it. I drew it. I always regretted selling it, and when I started playing again, I missed it. I looked for, and eventually found, an ’85 jetglo 330 with a white on black truss rod cover to replace it, all the better for being a little roughed up. This first change I made to this guitar was to have a black/white/black set of guards cut to replace the original white set. I’d always liked 330s, black ones especially, and Paul Weller’s black 330 always struck me as having followed a set of cues both less placid and more elegant than those that dictated the scrubbed tuxedo syle of the stock guitar. That white line just makes me smile. Already having the black truss rod cover pushed the point right up front, especially since Weller’s playing, in all its incarnations, has been and continues to be a big influence. When one of the original high gains failed, I tried to have it repaired but ended up replacing the pair with a very spectacular set of the earlier Rickenbacker design, which I was lucky and grateful to get. You can always add gain, or layers of gain, layers and layers. Less is more. A year or so after that, John Woodland posted a mockup of a new Mastery Bridge design. When he offered one of the M5 prototypes to the first person to identify its purpose, I jumped. Woody nailed it on the first try, and the bridge upped the ante on the guitar, making it sound impossibly more Ricky than ever. Dave Seüferling, who rescued me from a sheared mounting screw when I added the custom vibrato the bridge ultimately made it impossible for me to resist, couldn’t get enough of it, hearing in it the chime and clarity of the best 60’s Rickenbackers. He has good ears. Dave is putting the polish on a 381 rework for me as I write this. Another Mastery. I keep it strung with thegts.co JM50s. Those cool (R\ tailpieces do you no favors beyond reminding you how slick Roger Rossmeisel really was. This guitar is a proof and a reminder of how great guitar guys mostly are, and a thank you too. It also turned out, as I figured out when I was installing the toasters, that it wasn’t the high gain at all but the solder joint that had failed. I finally confirmed that suspicion when I paid all the favors that made this guitar special forward by sending all the old bits to my friend Bill–who also should have known better in ’85–for his Fireglo 330.